A CHARMING AND WITTY TALE CHRONICLING AN UNUSUAL DAY IN THE LIFE OF A SHEEP DOG Every day Gus Dog goes to work in the back of the ute with his owner, Tom the shearer. 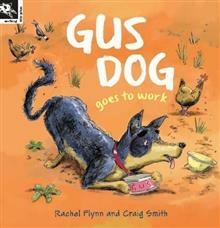 But one morning Gus wakes up to find Tom and the ute gone. So Gus Dog decides to go to work on his own. Along the... read full description below.